Bishop r. Jones Moore, Sr. is proud to announce that on Sunday, March 30, 2013, Reverend Richard Johnson was ordained as the Youth Minister at Sunrise. 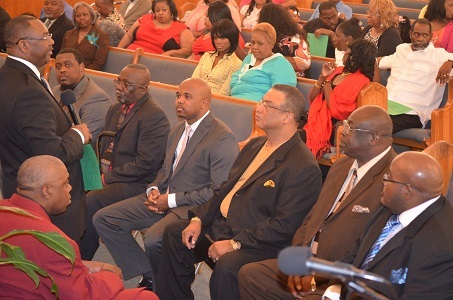 Five Deacons were also ordained during this special service. The Deacons are Dea. Wayne Gafford, Dea. Brent E. Smith, Dea. Jimmy Barnes, Jr., Dea. Steve Robinson and Dea. Jessie Shepherd. Bishop Isaac Brooks was Moderator of the Ordaining Council and Rev. Stephen Gaston was the Clerk of the Ordaining Council. Bishop Moore, Rev. Fredrick Branch and Rev. Michael Russell were also on the Ordaining Council.